From the movie Aladdin: "Seek thee out the diamond in the rough." 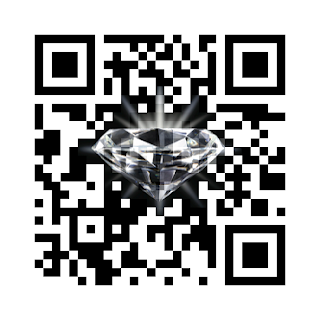 The art with diamonds is to cut the facets so the light return is maximized through the top of the diamond, giving and exceptional brilliance..
A QR Code is build up with black and white elements that can be translated to a binary number notation. The number of facets or possibilities that can build up a valid QR Code are therefore a power of two. The current displayed code, a version 3, medium error correction, can hold 44 bytes. that is 44 * 8 equals 352 bits. valid possibilities, for only one version of qr code. This number will be slightly limited when the content also needs to have some relevant information or when a graphic is inserted, but we will not run out of valid (custom) qr codes any time soon.